Discover the man behind the moustache in this book of one-liners by the world's most famous Belgian detective, revealing the wit and wisdom of Hercule Poirot and his creator, Agatha Christie. A perfect stocking-filler for every Christie fan, to help celebrate her 125th birthday. Discover the man behind the moustache in this book of one-liners by the world's most famous Belgian detective, revealing the wit and wisdom of Hercule Poirot and his creator, Agatha Christie. A perfect stocking-filler for every Christie fan, to help celebrate her 125th birthday. `My name is Hercule Poirot and I am probably the greatest detective in the world.' The dapper, moustache-twirling little Belgian with the egg-shaped head, curious mannerisms and inordinate respect for his own `little grey cells' solved some of the twentieth century's most puzzling crimes. But what do we really know about the eccentric genius underneath that fussy facade? 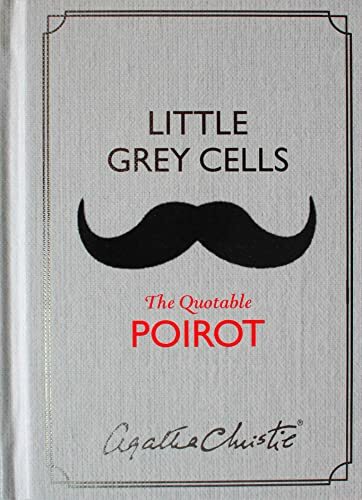 Sometimes funny, often profound, and always revealing, this book of quotes and comments, from more than 50 Poirot novels and short stories, gives an entertaining glimpse of the man behind the moustache, and the wit and wisdom of the Queen of Crime who created him. Includes an exclusive essay by Agatha Christie from the archives on her love/hate relationship with her most famous creation.